A message to parents during santa photos. The perfect Santa photo is the one that captures a real-life moment. You probably don’t remember the first time you sat on Santa’s knee. People were probably goo-ing and gaa-ing at you, jumping around with toys behind a camera trying to make you smile. You may not remember whether or not you smiled, but there is a photo somewhere that will tell you how it went down. It may have looked like this. Image via Funny Santa Photos Facebook Page. You will, however remember your own children&apos;s first Santa photo. You&apos;ll remember goo-ing and gaa-ing at them and jumping around behind a camera with toys and a big smile on your face. I will remember you and your children too. I was a Santa photographer. I was the lady behind the camera, clicking her fingers and jiggling toys at babies and toddlers on Santa&apos;s knee. I loved my job. I loved listening to Christmas carols on repeat for a month straight. I enjoyed chatting with my jolly Santa when the lines were low. I enjoyed watching kids in matching Christmas outfits sit on Santa&apos;s knee and loved seeing their faces light up when they got to speak with the man himself. But what I didn&apos;t enjoy were the parents who came in and wanted a one-week-old baby to smile. The parents that wouldn&apos;t give up until their newborn had the perfect smile shining across their face. Or the parents who forced their quivering two-year-old to sit on Santa&apos;s knee while they howled a scream that you only imagine in nightmares - because for them it was their nightmare. They might not smile. Image via Funny Santa Photos Facebook Page. To all the parents who exhausted themselves only to walk away with a photo they were disappointed with, I have a message for you. A newborn baby doesn&apos;t know how to smile. 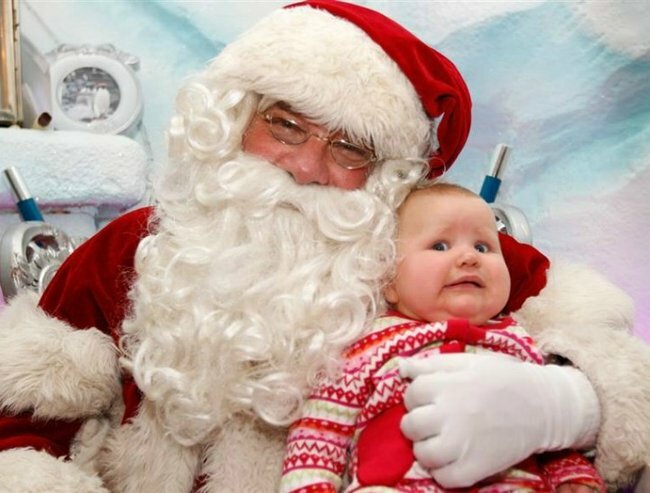 Don&apos;t worry if it&apos;s just a photo of your tiny bundle laying emotionless on Santa&apos;s lap. They&apos;re still cute and you will remember that moment for what it was. A toddler is taught to be wary of strangers. So when you tell them to go and sit on a strange man&apos;s lap, a man whose face you can barely see behind a white beard and red suit and hat, don&apos;t be surprised if they freak out. Don&apos;t force a quivering, screaming child to sit on a strange man&apos;s lap while you dance around behind a camera. Toddler&apos;s have a right to be scared. Image via Funny Santa Photos Facebook Page. Either drop the screaming child, run out of shot and laugh a little before rescuing them from the lap of fear. Or sit with them and be ok about being in the photo. They&apos;re funny times, you will remember that moment for what it was. If they&apos;re &apos;so too cool to smile&apos; that&apos;s funny. Image via Funny Santa Photos Facebook Page. So to the parents who want that &apos;perfect&apos; Santa photo. From the lady behind the camera. Stop trying to make your unsmiling children smile. Because when you look back at that photo of an unsmiling child, you&apos;ll remember that moment for what it was. For what it really was. And that&apos;s the best memory of all. What&apos;s the funniest Santa photo you&apos;ve been in?